SACRAMENTO – The California Department of Food and Agriculture (CDFA) announced the list of practices it is proposing to add to the Healthy Soils Program at the meeting of the Science Advisory Panel on Thursday, March 15th. 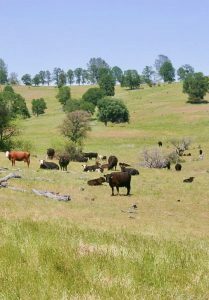 CDFA proposed fourteen new practices, including three proposals CalCAN submitted for prescribed grazing, conservation crop rotation, and nutrient management that reduces nitrogen application rate by at least 15%. The Air Resources Board (ARB) will now evaluate the practices and, if approved, determine a greenhouse gas (GHG) quantification methodology for each before making them eligible for incentives. COMET-Planner – the existing GHG quantification tool for the Healthy Soils Program – already includes all of the above practices except nitrification inhibitors, so ARB will most likely approve those thirteen practices, which CalCAN has long supported. However, CalCAN opposes the addition of nitrification inhibitors to the program. As explained in our nutrient management proposal to CDFA, nitrification inhibitors do not improve soil health and do not yet have sufficient California-based evidence or agreement within the scientific literature to merit an incentive. CDFA staff stated they were still considering these three practices but would likely not be able to work with ARB to develop a quantification methodology in time for the next round of the Healthy Soils program. We will follow up with staff at ARB to find out more about their barriers to developing additional quantification methodology and support their effort in any way we can. You can see CDFA staff’s full Healthy Soils update presentation (pages 44-66) in the Science Advisory Panel Meeting’s Binder. CDFA staff’s presentations also shared new analysis of the first round of Healthy Soils incentives projects, results from a survey of incomplete Healthy Soils applications from the first round, and results from an ongoing audit of State Water Efficiency & Enhancement Program (SWEEP) projects awarded in 2015. We will share more about this new data in upcoming blogposts, so stay tuned for more soon. REMINDER: CDFA is accepting applications for the Healthy Soils Program on a first-come, first-serve basis until 5:00pm on April 13. A list of 16 technical assistance providers is available here. Please note that none of the proposed practices discussed above are eligible for this current round. The current list of 15 eligible practices is available on page 6 of the Request for Applications.